Perth. So apparently the weather here is ‘cold’ for the summer, but the sun is shining and the most isolated capital city in the world is stunning. Perth is an extremely laidback city. The people are bronzed, healthy and far too goodlooking for my taste. The food is great, especially the Chinese food and the seafood (two of my favourites). The main shopping centre is outdoors, pedestrian only and between two major streets. The public transport in Perth is probably its most impressive feature. The downtown buses are all free, with one leaving right from the front of our hotel and reaching the centre of the city within minutes. The rest of the public transport, including the trains, are really easy to navigate and we arrived at the beach without any hassle. It seemed like every time we arrived at a beach in South Africa, the weather turned on us. But here in Perth the sun held out and we spent all afternoon at Perth’s main beach: Cottesloe. Fortunately, the summer hols don’t begin in Australia until the second week of December, so the beach was relatively quiet. We packed some sandwiches, grabbed Jason’s rugby ball and tanned to our heart’s content. I’m not normally one for sunbathing, but after some heavy travelling, lying on the soft white sand was a perfect way to recuperate. We’ve arrived in Perth safe and sound. The weather is beautiful and we are enjoying a few nights in an apartment-style hotel (thanks Mum and Dad!!) while we plan the next few months of our adventure. But what about the last few days in Africa? Jeffrey’s Bay is the South African surfing mecca, and true to form I had to try it. Ever since my sister’s first trip to Hawaii, I have been bombarded by stories of her surfing success — I aimed to equal it! I failed miserably (it is much harder than it looks!) but I did manage to stand on my own for a few glorious seconds. After leaving Jeffrey’s Bay, we entered Lesotho where there was no internet, let alone a telephone (the campground we stayed at uses radios to keep in contact with the outside world). Lesotho is nicknamed “the Kingdom in the Sky” and for good reason. All around us spread amazing mountain views. We spent one night bush camping on the edge of a cliff and woke up the next morning being buffeted by strong winds. Sarah and I managed to keep our tent in one place, but some people weren’t so lucky! After securing (and in some cases, rescuing) the remaining tents, we hustled toward Malealea Lodge. The weather was sunny and beautiful, although there were some threatening clouds looming in the distance. 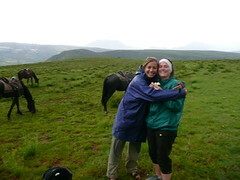 The owner of the lodge encouraged us to go pony trekking that day, before the bad weather set in. Three of us (Katie, Leahanne and myself) took his advice and set off on a 6-hour trek through the Lesotho hills and mountains. Bad idea. Only half and hour into the ride and the rain came down in a fury. Closely following the rain? Hail stones the size of golf balls. It felt like we were under attack! The ponies, bless them, plodded on dutifully through the rain, somehow managing to keep their footing down the steep – and now very slick – hillsides as we descended into gorges and back up again. By the end of it we were drenched but smiling. The views were still incredible, with the rain clouds casting an eerie grey mist over the landscapes. 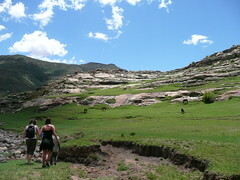 We managed to get our sunny tour of Lesotho the next day, when we hiked to a waterfall.